Nakakaloka tong si Anika. Abugado siya ni Alvin. Yesterday, Alvin said he’ll just go out daw. He said he’ll be home by 9 to 10pm. He was with Alfred so medyo duda ako uuwi ng maaga yun. ME: Anong oras na wala pa Tatay mo. ANIKA: Nanay, it’s not even 10 yet. He said he’ll be home at 10. ME: He said he’ll be home between 9 to 10 pm. Tawagan mo siya. Ask him where he is na. ANIKA: Okay. But don’t judge him! She says that all the time. Anika tried calling Alvin. He wasn’t answering. ANIKA: Maybe he’s on his way home already. ME: How are you sure? ANIKA: Maybe he’s not answering kasi he’s driving. ANIKA: Naman ‘to oh! Baka traffic noh! You know! ME: Traffic?! Eh dala niya yung motorcycle niya. And diyan lang talaga siya galing kala lola mo eh. I saw Anika typing furiously on my cellphone. She looked worried. ME: Tara, let’s sleep na. ANIKA: No. I will wait for Tatay. ME: It’s late. It’s 10:15 already. He said he’ll be home by 10pm. I will lock him out of the house. ANIKA: Why will you do that?! That’s so mean! ME: If you tell me you’re going home at 10pm, you need to be home by 10pm! Otherwise, you get locked out of the house. ANIKA: Who will open the door for Tatay? How will he go inside if you will lock it? I hugged Anika and told her it was just a joke pero deep inside hindi joke yun kasi bwiset na ako kay Alvin. Anong petsa na, wala pa. I called Alvin and gave him a little piece of my mind. Mga 1 minute lang. Anika didn’t hear it. Ten minutes after, I could hear Alvin na outside. Natulog na ako. My eyes were already closed and I was pretending to sleep na when Alvin went inside our bedroom. ANIKA: Why are you late? Nanay wanted to lock you out of the house. I cried so she wouldn’t do it. ALVIN: Nanay will never do that. Alvin tried to make me lambing pero dineadma ko until nakatulog na nga ako ng tuluyan. This morning, Alvin called me about something nonsense. Ganyan yan pagmay kasalanan tapos nakikipagbati. I told him he shouldn’t do what he did last night. Anika heard him that he’ll be home in a specific time. He needs to be home on the time he said he’d be home otherwise, Anika will think that it is okay na umuwi beyond curfew time. Not that Alvin has a curfew. He doesn’t. He can go out and go home whenever he wants basta magsabi lang. My point is, he gave a specific time when he’ll go home. He has to follow it. 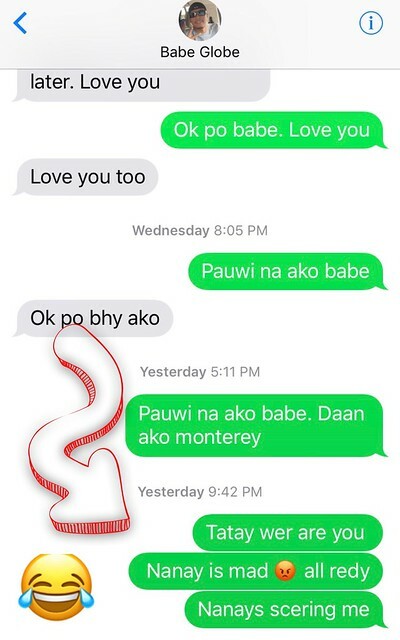 I told Alvin baka bumalik yan sa kanya pagnagdalaga na si Anika. Anika might think, since ginagawa din ni Alvin, it’s okay not to honor the time you said you’d go home. Di ba?! I learned that from Wowa eh. Kaya nung dalaga ako, when she asks me what time I’ll be home, ang sagot ko is, “Late na po.”.